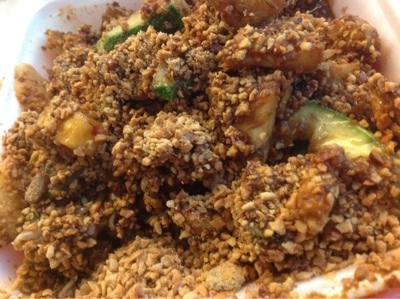 Rojak is a local salad made up of mixed vegetables and fruits like cucumbers, bean sprouts, turnips and pineapple, drizzled with a sweet and sour salad sauce of prawn paste, lime and sugar. The final touch was a generous drizzle of ground peanuts to add that extra oomph to the salad. 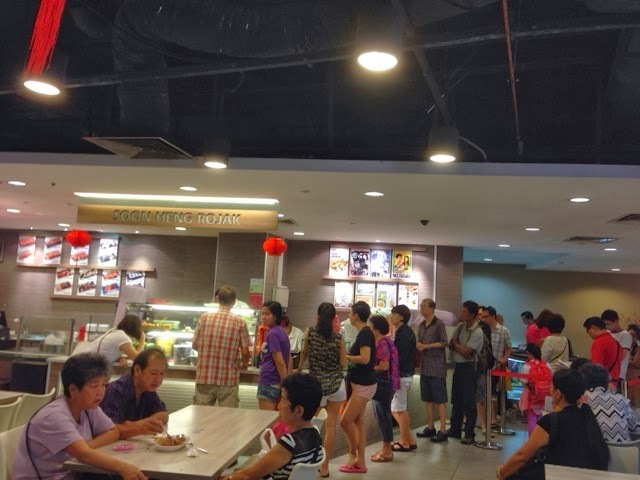 Nestled in the bustling neighbourhood at HDB Hub Toa Payoh, Soon Heng Rojak is very popular with neverending snake-like queues. It was an interesting phenomenal and I decided to join the 45-min queue to try the popular dish. Despite of taking huge orders from customers, the line moved relatively fast. There was one customer who bought nine large boxes of rojaks and another six. The 'mixer' was working like a mechanical robot. He did not stop to rest. Another colleague was busily cutting the you tiao (long dough fritters) into smaller pieces. And another was busy taking orders from customers. It was like a production line where each person had a role to play. Finally it was my turn to make the order. I ordered the large serving of Rojak that cost $5.00. The smallest serving costs $2.50. I immediately opened the box to try the salad. I wanted to know if it was really worth the queue and long waiting time. Apparently, I was disappointed with the sauce as I expected more. The sauce is crucial for a good salad. First of all, too much sauce had spoiled the entire salad although the youtiao was thoroughly soaked into the sauce. Secondly, the sauce was too sweet. I could taste the sugar granules in the sauce. To sum up, I think I rather skip this stall and buy from better rojak stalls. I have tried some and believed that there are better ones out there. We had dinner at the food court again and saw the long queue at Soon Heng Rojak stall. We still could not fathom the reason of its popularity despite of its super sweet sauce and cold chewy fried fritters.